Motorola’s CEO has recently hinted that a $50 Android phone may be in the works at Motorola: “In much of the world $179 is a lot of money so there’s a big market at a price point of less than $179”. I was already expecting them to make a $99 version this year, but $50 is even bolder, and quite possible, too. Actually, $50 Android smartphones being sold in Africa from Huawei or other local manufacturers have existed for a couple of years now. It’s just that they tended to have very old and slow chips in them, super low resolution tiny screens (320×240 at 3″), and Android Froyo, which I think people barely remember it even existed at this point, that’s how much time has passed since it was first launched. Suffice to say that the experience on them wasn’t too great, and you may still have been better off buying a feature phone than get slowed down by a “smartphone” that didn’t work properly (not that $50 feature phones were that much faster at the time). The processor could actually be Cortex A5 for cost reasons, but that one is getting a little old in the tooth, and I have a feeling Motorola will want to go with Cortex A7, which is its successor, and should provide pretty decent performance, even if it doesn’t come in a quad-core variety like the Moto G. Not being quad-core allows them to save quite a bit on the chip, and I doubt that at this price-point they’ll go even with a dual-core one, but I’m not completely ruling it out. The GPU is uncertain because it won’t be their main priority, and they’ll just buy whatever SoC with a single core Cortex A7 that’s best for the money, but I expect it to be in the Mali 400-range of performance or possibly even Mali 450 (newer, but made for lower-end phones). At this price point, 512 MB is the only reasonable expectation. But with KitKat or better, I don’t see it have any trouble working properly. I’ve used 512 MB phones with Android 4.2, and they worked just fine. I expect KitKat or later to work even better. I really wouldn’t expect more than 4GB of storage, especially when Motorola couldn’t even offer more than 8 GB of storage for the Moto G last year for the base model. I do find this a bit of a problem, especially since Google/Motorola are being stubborn about using microSD cards at least with an open source exFAT implementation, if they really want to avoid paying Microsoft any royalty. the internal storage should be using the flash optimized F2FS file system, just like Moto X and Moto G, which I’m hoping will come as the default for the next version of stock Android, too. The resolution could be 480×320, but seeing how Motorola seems to care a lot about having a “decent” resolution even in low-end smartphones, to be able to watch videos at a higher quality and have a better browsing experience, I’m betting it will be at least 800×480. This resolution would also be more suited for the 4″ screen size that I think they will be using. I’ve thought for a long time, even when iPhones used to have the “perfect” 3.5″ screen size, that smartphones need to be at least 4″ in size, even if given to kids (smaller hands). Anything less than 4″ just doesn’t provide a good “touch smartphone experience”, in more ways than one, and it’s harder to type on them, too. It’s a shame so many ultra low-end phones today still arrive with 3.2″ screens, because I find them simply unusable. I expect Motorola to change this. I wish the camera will be at least 5 MP, not necessarily because of the higher resolution, but because camera suppliers tend to make 3 MP cameras that are disproportionately worse than the 5 MP and above cameras. They tend to do that supposedly because they think their customers, the OEMs, care more about a bottom price for it, than any performance it might offer. They just want to check that “camera” item on the list. So even if they don’t use a 5 MP camera, I hope Motorola will at least pick a decent 3 MP camera. As for the front-camera, chances are very high that it won’t exist. There are still phones even in the price range of Moto G that don’t offer a front-camera at all, so it wouldn’t surprise me if a $50 came without a front-camera, but I wouldn’t rule out them adding at least a VGA (0.3 MP) one. Don’t expect LTE with this device. If Moto G didn’t have it, this one definitely won’t either. Plus, in markets where this phone will be selling there will likely be no LTE networks for years. I expect Motorola to use a larger than average battery at this price level, and if it has only a single core Cortex A7 CPU, it should provide decent battery life (at least a day). Obviously, the device will arrive with KitKat at the very least, but if it’s being launched this fall, then it might come with whatever version of Android Google has prepared for the Google I/O event. KitKat was already optimized for such devices, so it should do well on its own. However, it’s possible Google will further optimize Android for $50 bargain smartphones, so it would make even more sense for Motorola to launch it with the new version. Sub-$100 smartphones is what’s going to double Android’s growth rate from 1.5 million activations per day to 3 million per day, in the next 2 years or so. 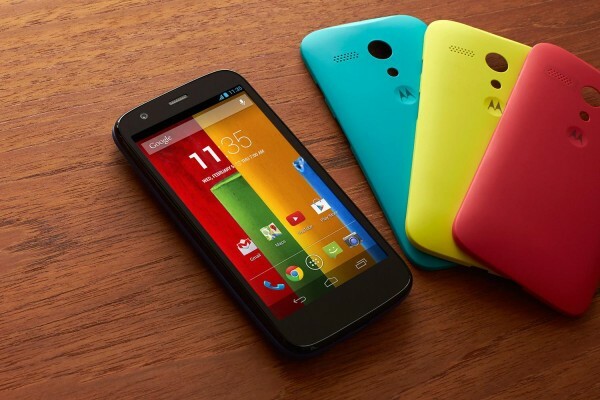 Motorola is being very smart by trying to conquer these low-end and super low-end markets. Even if it doesn’t make them a lot of money in the first few years, it should help them significantly increase their brand awareness and market share globally. Motorola could really use that, because right now they don’t even sell any phones in most countries, and this is the way to make a strong comeback in the minds of consumers. If most people end up using a Motorola, even a low-end one, they can later upgrade to more expensive models. That’s Motorola’s long term plan, and it’s a good one.